If you own or run a small or local business, you know the numerous challenges you have on a daily basis. It doesn’t take an article to tell you that you are like a juggler of people, things and priorities. Not only are you running the day-to-day operations of your small business, but you also have to stay on top of all of the specific industry, supplier and competition news that is continually pulling you away from the many urgent items that keeps a small business afloat. As if that weren’t enough, you also have to be concerned with your small business marketing, local digital marketing and their seemingly endless and constant changes. We get it, you’re slammed. The last thing you need is to have to continually read the latest articles and stats on local business marketing, small business marketing, content marketing and the list goes on. So we decided to put together a short post that will get you the latest details and small business marketing statistics surrounding the changing local business marketing environment and put it into a quick easy to follow article. Small Business Growth Stats – Let’s start out with some good news for the small local business general outlook. A new report shows that small businesses are expecting real growth this year. Here are some of the important small business statistics that came out of this research. 44% of small local business say they have a significant or slightly better confidence in the economy. 71% of local business owners expect an increase in revenue this year. 37% of small business expect more than a 5% revenue increase. 32% expect a modest revenue growth of 1-4% in their small business. 43% of small businesses say that improving existing customer experiences and customer retention is their top strategy for revenue growth. 50% of all local business plan to hire more staff this year. Small Business is seeing higher credit approval rates. 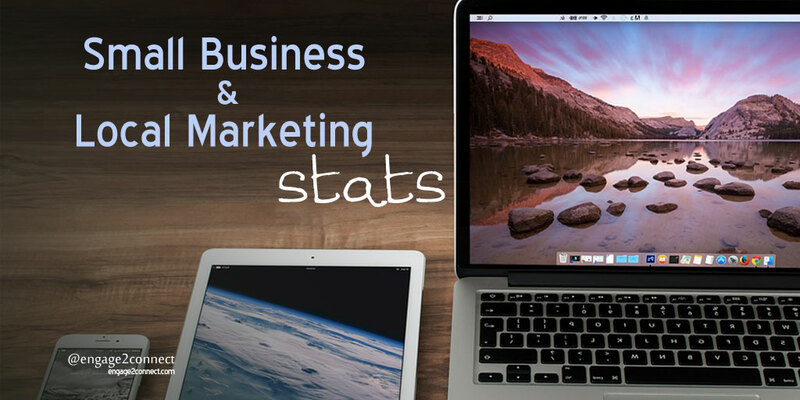 Local Business Marketing Statistics – Local business marketing, small business marketing and retail marketing is seeing some interesting numbers as well. Here’s the brief details. 62% of small business are investing 4% or more of their revenue on local business marketing. 56% of small businesses use local business digital marketing combined w/ 44% using traditional marketing channels. Roughly only 50% of small businesses have a website. Yes, you read that correctly. 30% of small businesses without a website, cite cost as the main factor. Top areas for small business website improvement? 1 – SEO: Search marketing, search optimization and paid search marketing. 2 – Social engagement: Better connection between social sites and the website. 3 – Content: Additional site content, content marketing, blog, graphics and general content creation. 4 – Design: Improving the overall design, look and flow of the website. 24 percent of small businesses plan to build a website in the near future. 68 percent of small businesses with a website say that they have a mobile-friendly website. Only 34% of small businesses use social media for marketing and to engage with customers. Only 80% of small businesses use social media and many continue to underutilize SEO, content marketing, blogging, social media and video. 54% of small businesses outsource graphic design and website development. 12% of small businesses outsource marketing, public relations and advertising. 44% of small businesses plan to increase IT spending this year. These small local business marketing statistics represent a changing of the times for small businesses. Since most business leaders believe that a website today is relevant and crucial to every small business in any industry, small business is at a crossroads. However, just having a local business website is no longer enough. The escalation of integrated digital marketing at the small business level, including search, blog and additional content marketing, is creating opportunities that most small businesses are missing. Small local businesses that recognize the changing digital marketing climate and make dramatic shifts to their local marketing strategy, tactics and channels, can make huge strides over their current and future competition. Local brands that do not see the writing on the wall are going to be in trouble if they do not invest in effective digital marketing to keep pace. That said, 38% of businesses are currently investing resources toward creating sustainable, scalable customer relationships that improve their local customer experience. Having a store front or a website means you are in business, but it certainly doesn’t mean you will succeed as a small business. Today’s consumer is online and has expectations that big brands and some small local companies are starting to meet. The opportunity for the small business is to keep pace with these growing digital consumer expectations so they find you and give you their immediate and long-term attention online.